2. 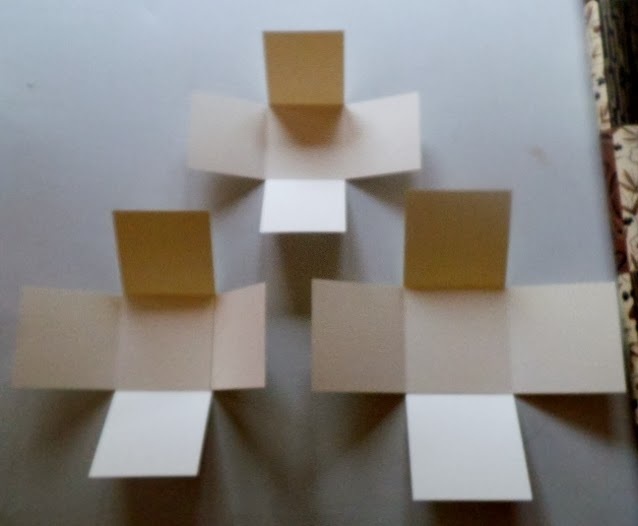 Score each panel on the Tri-fold line, turn card and score again on the Tri-fold line, do this for both panels. and secure the ribbon with the last plain panel. 7. To create the lid, cut a panel 16 1/2 cm Sq, and score it on the 2nd line of the LID side of box side of a crafters companion board, or at 3cm. 8. 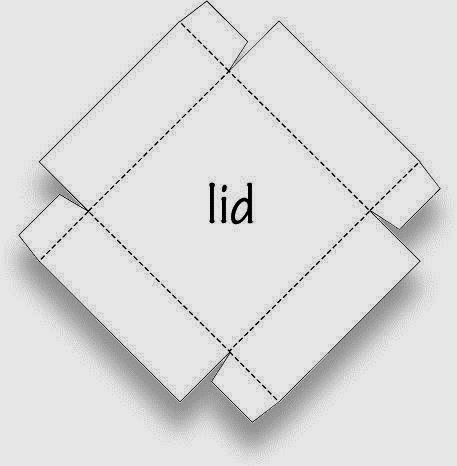 Fold all the scored lines, and trim a snip away from each corner, (see image 4) and fold in the corners and stick with hot glue or Hi-tac tape, Decorate the lid with the last embossed panel. 10. Stick the butterflies to the acetate and cut out, folding the wings either side of the body, to allow the butterfly wings to stand up. and stick inside the box. 11. You can add sentiments or images to each of the inside panels. Each matting layer should be 1 cm smaller than the panels. 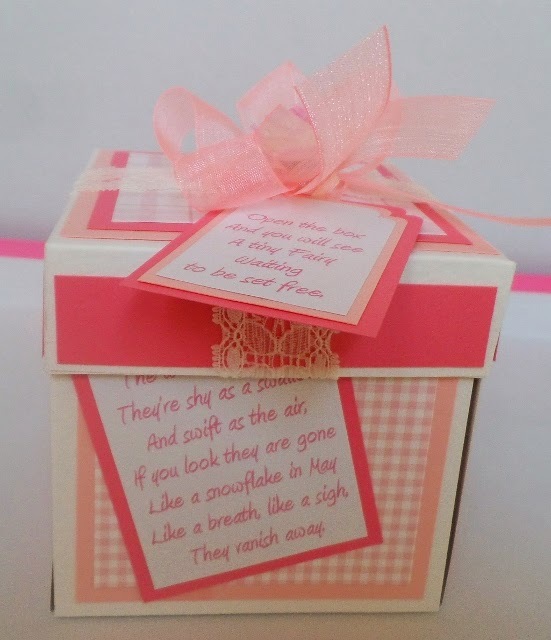 Stick the 3 decorated boxes together. over lay each 10cm panel to make the base. 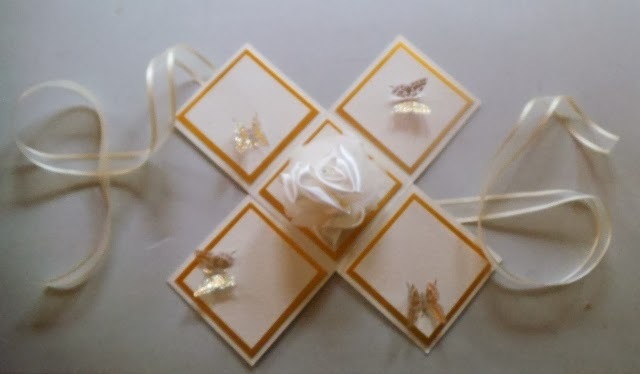 and 3 gold panels 9cm Sq and 3 cream panels 8cm Sq, these are for the Lid, Base, and inside floor of the box. 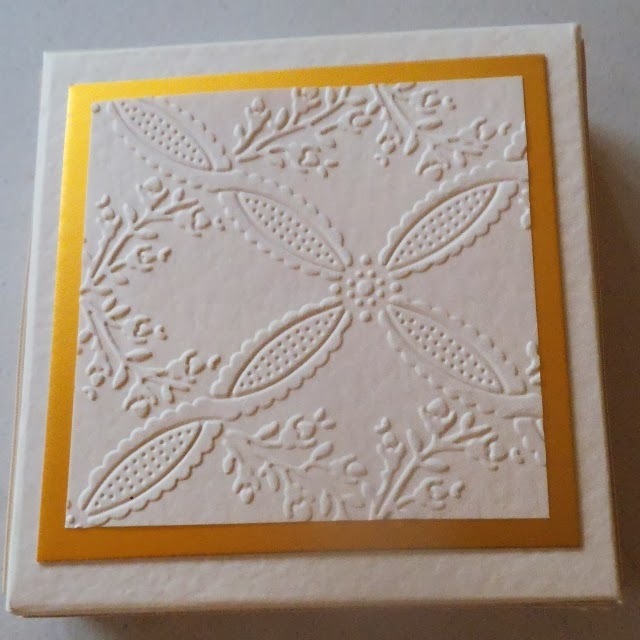 The lid for the 10cm Sq box fits this box. Below is a Flower fairy box I made about 2 years ago. 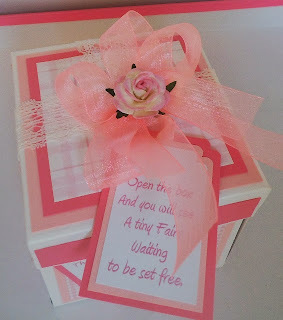 the lid was finished with lace, a fairy tag, bow and rose. 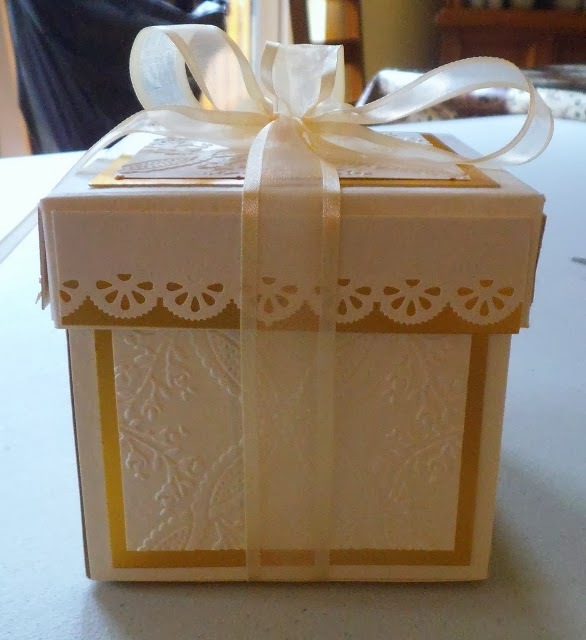 over view of the box. 3. 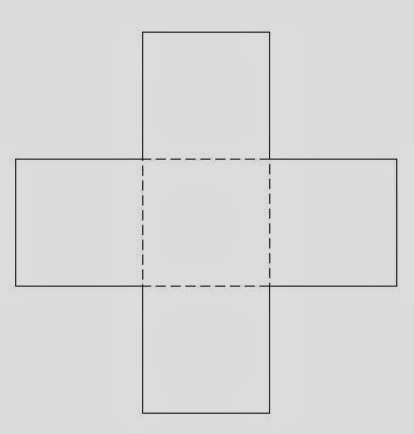 Give some detail to the outside edges of the pop-out, with a deep edge punch. 4. And cut an oval aperture from the centre of the pop-out with a X Cut oval template. And stick a Strip of Hi Tac tape to the outside edges, near the punched boarder. 6. 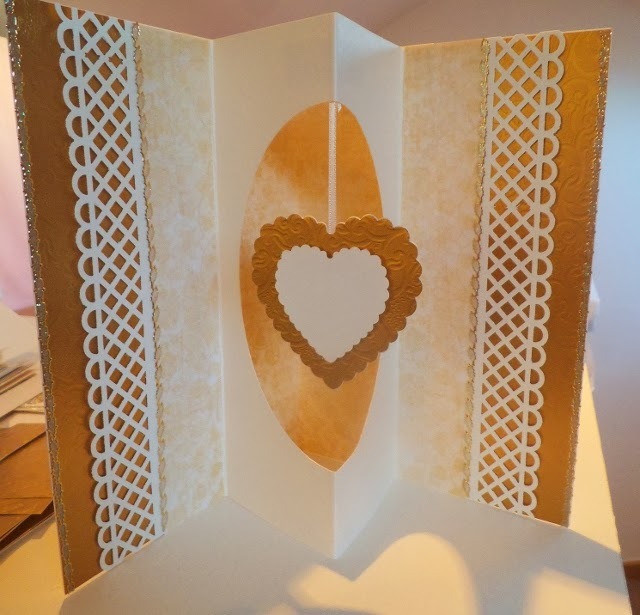 Stick a Folded A5 sheet of pretty paper to the inside of your card like an insert. 7. 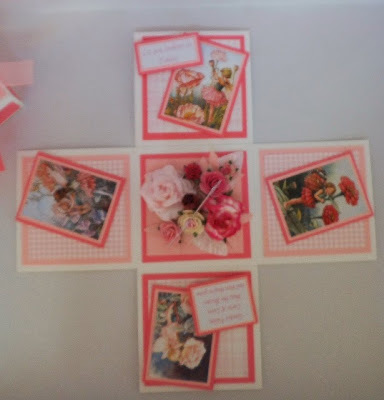 Stick the Pop-out panel to your card, Starting with the right hand side. 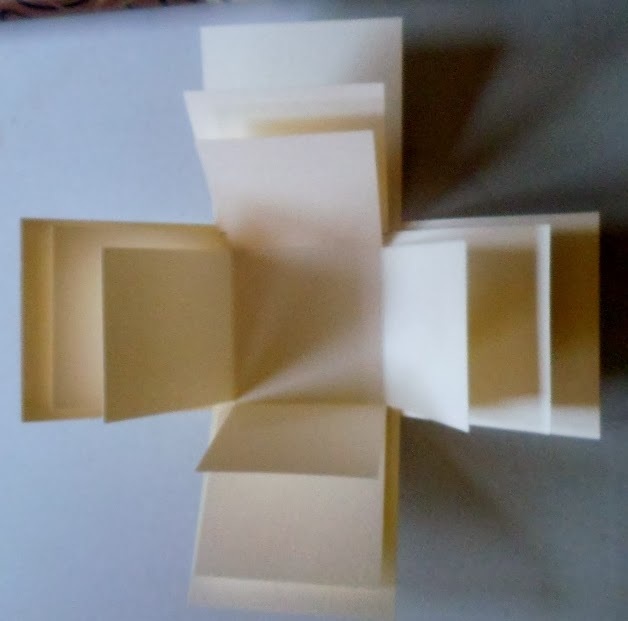 (about 4cm in from the edge,) Close the pop out, and remove the backing from the tape, hold the pop-out flat, and close the card shut, your pop-out should be perfectly lined up. 8. Stick the 2 4cm by 21cm Paper strips either side of the aperture panel, and add a peel-off border to the strip of paper, and to the Gold Strip. 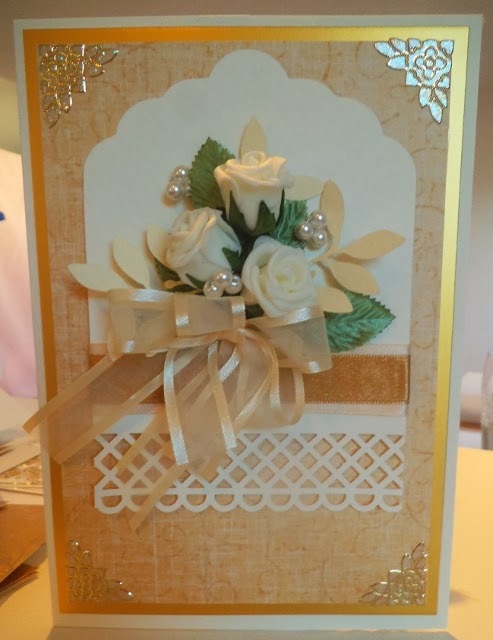 10.Wrap the cream ribbon across the die-cut punched panel, and secure at the back, overlay the gold ribbon and secure at the back, stick this panel raised on foam tape to the card front, towards the top of the card. 12. Add a peel-off corner to each corner.